Jake Ball, who is fully fit after a scare in the lead-up to the Ashes Test series in Australia. (PHOTO BY: Mark Fear). Mansfield bowler Jake Ball insists he is fully fit for England’s first Ashes Test against Australia at The Gabba, which starts on Thursday. 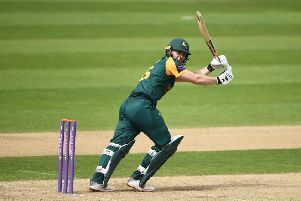 The 26-year-old Nottinghamshire seamer damaged ankle ligaments in his delivery stride during a warm-up game against a Cricket Australia XI in Adelaide. And although he missed the team’s final warm-up game, he has since returned to bowling in the nets and says he is ready to play against the Aussies, if selected. Ball and fellow seamer Craig Overton are vying for a pace in England’s seam attack, alongside Jimmy Anderson, fellow Notts bowler Stuart Broad and Chris Woakes. “I feel like I have had enough bowling so, hopefully, come the first day, I will be ready to go,” said Ball. “I had my eyes closed for a split second when I went over my ankle. It did hurt at the time, but I managed to get a bit of movement while I was out there and, walking off, I didn’t seem too bad. “As soon as I got the results back from the scan, it was all positive and really good. The medical staff have been amazing and have sorted me out and I am back fully fit now.